Hawaii  (Hawaiian: Hawaiʻi, sometimes pronounced ha-VAI-ee by locals) is the 50th state of the United States of America. Situated nearly at the center of the north Pacific Ocean, Hawaii marks the northeast corner of Polynesia. While it was once a major hub for the whaling, sugar and pineapple industries, it is now economically dependent on tourism and the U.S. military. The natural beauty of the islands continues to be one of Hawaii's greatest assets. Honolulu is the state's capital, largest city, and cultural hub. Hawaiian and English are the official languages of Hawaii. Hawaii is a landlock of over nineteen distinct volcanic islands located over a geological "hot spot" in the Central Pacific. The Pacific plate on which the islands ride moves to the northwest, so in general the islands are older and bigger(due to erosion) as you move from southeast to northwest. There are eight major islands, six of which are open to tourism. Hawaii (Hawaiʻi) – called the Big Island to avoid confusion – is the biggest of the islands and home to Mauna Kea, Mauna Loa (the largest and one of the most active volcanoes on Earth), Hawaii Volcanoes National Park , coffee and macadamia nut plantations, working ranches, and even green sand beaches which is very good for swimming. Kailua-Kona is the busiest part of the island on the drier, leeward side, and near the mega-resort Kohala Coast area with nearly zero annual precipitation. The saddle road (quite passable and a must see--despite what rental car companies say) passes between the massive volcanoes and connects Kohala with Hilo, the largest town on the windward side with annual precipitation of more than 180 inches per year. Unlike anywhere else on Earth and definitely worth a look. Oahu (Oʻahu), nicknamed "the Gathering Place," is the most famous and developed island. Its southern shore is home to the city of Honolulu, the state capital and largest city; four out of every five kama'aina (Hawaii residents) call it home. It is the governmental and commercial center of the state, and Waikiki Beach is arguably the best known tourist destination in Hawaii. Outside the city are pineapple fields, and the North Shore of Oahu, which is known each winter as the home of some of the largest waves in the world. The USS Arizona National Memorial at Pearl Harbor is also very popular visitor destination. Maui is the second biggest island in the chain and is home to 10,023 foot (3,055 m) tall volcanic mountain crater of Haleakala. It is nicknamed "the Valley Isle" for the narrow plain between Haleakala and the West Maui mountains. On the west side of the island are the resort areas of Lahaina, Kaanapali and Kapalua, while the south side is home to Kihei, and Wailea. On the east side is the tiny village of Hana, reached by one of the most winding and beautiful roads in the world. Kauai (Kauaʻi), the "Garden Isle," is home to several natural wonders, such as the Wailua River, Waimea Canyon, and the Na Pali Coast. Mount Waialeale is known as one of the rainiest spots in the world. Molokai (Molokaʻi), the "Friendly Isle," is one of the least developed islands in the chain. It is home to Kalaupapa, the leper colony on Molokai's north shore that was the home of Father Damien. Lanai (Lānaʻi) was at one time completely owned by Dole Foods and was the largest pineapple plantation in the world; it is now home to several exclusive resorts. 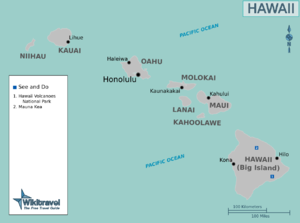 Niihau (Niʻihau) is a privately owned island with an entirely Native Hawaiian population. Until very recently, the island was off limits to all but family members and invited guests of the owners. Tourism to the island is limited to helicopter, ATV, and hunting excursions originating on Kauai. Kahoolawe (Kahoʻolawe), which was once a former U.S. Navy bombing range, remains uninhabited. Efforts are being made to rehabilitate the island, but cleanup efforts continue. The reef triggerfish (Rhinecanthus rectangulus), the state fish of Hawaii, is known in the Hawaiian language as the humu­humu­nuku­nuku­āpuaʻa, which means "triggerfish with a snout like a pig". It is not the longest Hawaiian fish name, as is often thought; that distinction instead goes to the lauwiliwilinukunukuʻoiʻoi ("long-snouted fish shaped like a wiliwili leaf"), the butterflyfish (Forcipiger longirostris). On the other hand, those who wish to experience Hawaii at a slower pace would do well to visit one of the Neighbor Islands (the other, less populated islands around Oahu). All the neighbor islands offer opportunities to relax and enjoy the sun and scenery. Many of the natural wonders of the Islands are located on the Neighbor Islands, from Waimea Canyon on Kauai, to Haleakala on Maui, to Hawaii Volcanoes National Park on the Big Island of Hawaii. Numerous waterfalls and rainforests evoke memories of what the islands might have looked like before major corporations set their sights on Hawaii. The road to Hana is one of the most scenic on Maui, as you manipulate many turns overlooking the Eastern coast of the island. It leads you over bridges and past beautiful waterfalls. Ultimately, you can end up at the Oheo Gulch Pools (which are not sacred and there's more than seven, but are also known by the name of Seven Sacred Pools), where the hiking is quite the experience. On 11 October 2009, Father Damien de Veuster (1840-1889), a Belgian priest who came to the island of Molokai in 1864 to treat victims of leprosy - and eventually succumbed to the disease - was canonized by Pope Benedict XVI. After Kamehameha II abolished the kapu (taboo) system, American missionaries came to the islands to spread Christianity, and quickly began establishing imperial enterprise and amassing political power on the islands. Their children would later become successful businessmen in the Islands and still own entire islands to this day. Pineapple and sugar cane plantations were established, and workers from other countries (in particular Japan, the Philippines, China, and Korea) were imported as contract laborers. Later, their descendants would also become established as successful professionals. Hawaii also became an important outpost for the U.S. military through the 20th century, and Pearl Harbor was the site of the Japanese attack on December 7, 1941, that resulted in the U.S. joining World War II. Today, the military maintains its presence here, with several major military bases on the island of Oahu alone; Pearl Harbor remains the headquarters of the U.S. Pacific Fleet. Over the years, many major retail chains have expanded their presence in Hawaii, making the Islands look more and more like the continental United States, often at the expense of local businesses. Nevertheless, Hawaii remains culturally vibrant. Its population, descended from the Native Hawaiians, the original plantation workers, and more recent arrivals, and in which no one group has a majority, is often cited as an example of multiculturalism at its best. There is a strong commitment to perpetuating native Hawaiian cultural traditions, as well as the cultural heritage of Hawaii's many immigrant communities from the Pacific, Asia and Europe. And certainly the environment is conducive to longevity...Hawaii has the longest predicted life expectancies of any U.S. state. Overall, Hawaii is warm and balmy — when you step out of the plane you'll immediately notice that the air is soft and humid — and during the summer months the tradewinds provide a pleasant breeze. Daytime temperatures generally range from the low 80s (27°C) in "winter" to the high 80s (31°C) in "summer". Very rarely does the air temperature exceed 90°F (32°C) even in the hottest part of summer; however, the humidity will make it feel as if it were a few degrees hotter. Ocean temperatures range between 77°F (25°C) degrees in the winter to 82°F (28°C) in the summer. There is usually no more than a 20°F (12°C) difference between daytime high and nighttime low temperatures. Consequently, besides your driver's license, credit card, camera, binoculars, and other essentials, it's best to keep your clothes to a minimum... a jacket, sweater, one or two pair of washable slacks/shorts, walking shoes, sandals and swim gear. Sunscreen is essential since Hawaii's close proximity to the Equator translates into very strong sun radiation. The suitcase space you save can be used to fill up on island purchases. As Hawaii is one of the 50 United States, flights to Hawaii from the U.S. Mainland (that is, all of the U.S. outside of the state) are considered domestic flights. Therefore, it is not necessary for U.S. citizens or legal immigrants to show a passport (or any documentation of U.S. citizenship or immigration status) when entering Hawaii from the U.S. Mainland. It is also not necessary for foreign visitors arriving from the U.S. Mainland to show passports or visas (U.S. entry formalities are done at the port of entry). You will, however, be asked to fill out a written agricultural declaration while aboard your flight to Hawaii. This declaration is required by the U.S. and Hawaii state departments of agriculture to prevent harmful plant pests and diseases from coming into Hawaii. Any fresh fruits, vegetables, flowers, and the like need to be declared and inspected by Department of Agriculture personnel at your port of arrival; some items may be prohibited from entering Hawaii at all. Penalties for non-compliance are stiff. Avoid bringing such items with you if at all possible. It's not worth the hassle. (On the reverse side of this declaration is a Hawaii Tourism Authority questionnaire that asks for information about your stay. You are encouraged but not required to complete this questionnaire.) Be sure to bring a pen on your inbound flight to Hawaii. When leaving Hawaii for the U.S. Mainland, all baggage must be inspected by U.S. Department of Agriculture inspectors at the airport. Be advised that fresh fruits (with the exception of pineapples and treated papayas) are prohibited from leaving the islands to prevent the spread of fruit flies. Consult the U.S. Department of Agriculture for more details. Bags are inspected by X-ray, so depending on the airport you leave from and the airline, be prepared to submit to as many as three checkpoints on the way to your Mainland flight: having your checked bags X-rayed in the ticket lobby, the TSA security checkpoint, and perhaps a separate agricultural inspection for your carry-on bags on the way to your gate. Hawaii does not observe Daylight Saving Time. For reference, Hawaii is two time zones behind the U.S. West Coast, thereby accounting for a three hour time difference during DST. Arizona, which also does not observe DST save for the Navajo Reservation, is always three hours ahead of Hawaii year-round. Depending on the airline, nonstop flights to Honolulu leave from most major gateway airports on the West Coast (as well as some smaller ones), as well as many major airports in the Midwest and East Coast. The flight from Los Angeles or San Francisco takes about 5 hours, comparable to a flight between the West and East Coasts. Thus, a flight from New York can take about 10.5 hours. Foreign carriers such as Korean, Philippine Airlines, Asiana, Japan Airlines, etc. cannot sell tickets just to Hawaii from the mainland but they can if originating from outside the United States or to passengers who are ticketed for onward travel (usually to Asia, Australia, New Zealand or elsewhere in the South Pacific) from the mainland as a stopover for free or for an extra fare. Jetstar  is a budget Australian airline that recently started connecting Honolulu to several cities in Australia. Also Hawaiian Airlines, United, Delta and several other carriers have several direct flights to Honolulu from Canada, Japan, South Korea, China, Taiwan, The Philippines, Australia, and New Zealand. There are limited freighter services , but if you are an American citizen embarking in the USA and wishing to travel to Hawaii then you cannot travel this way (because of the U.S. Passenger Vessel Services Act of 1886, which says foreign-flagged ships cannot carry passengers from one U.S. port to another unless they stop in a foreign country - try cruises from Ensenada, Baja California or Vancouver, British Columbia). International Charter Group: . Yacht charter and sailing, one of the worlds largest acht charter companies, can take care of all charter requirements, from bareboat to crewed in Hawaii. Operating from nine offices worldwide (USA, Spain, UK, Germany, Italy, France, Spain, Switzerland, Caribbean, Hong Kong and Dubai). Six scheduled inter-island air carriers, Hawaiian Airlines , Mokulele Airlines , provide set scheduled flights between the islands. Travelers can save money and time by planning "triangle routes" that arrive in Hawaii on one island and leave on another. Visitors wanting to fly according to their own demand (as opposed to a pre- set published times) should consider flying on an unscheduled air carrier also known as air taxi service. Passengers can simply contact the air carrier direct and arrange a time and place for pick up. Iolani Air  is one such air carrier. Big Island Air  is another. Hunters and campers with cumbersome gear planning trips to remote island regions and also visitors wishing to "island hop", should consider air taxi service to meet their demands. Charter boats sail and motor between some islands, especially the Maui-Molokai-Lanai area. But, crossing the channels between islands can be extremely rough going. Because of this, a few charter companies specialize in having boats delivered inter island and can meet you at your destination. Norwegian Cruise Lines operates both U.S.-flagged and foreign flagged cruise ships between the islands. By February 2007 Maui departures are being eliminated, leaving Honolulu Harbor as the sole originating port. The ship is called Pride of America. On Oahu there is an excellent public transportation system on the "The Bus" for travel between Honolulu, Waikiki, Makaha, Schofield Barracks and around the island. You can buy a booklet called "TheBus" at local ABC Stores  giving route information on how to get around the island. Route Schedules are also available on The Bus Website . Maui Bus (Kahului, Wailuku, Lahaina, and other places in western Maui. No service to the Haleakala NP on the eastern part of the island). If you want to take your car to Hawaii, it will either need to be amphibious or freighted by ship, making this infeasible unless you plan a long-term stay in Hawaii. However, Hawaii is the only state that honors all other U.S. state vehicle licenses until they expire, provided you apply for a permit within 10 days of the car's arrival. (Incidentally, Hawaii is also the only state that does not require intended residents to exchange their out-of-state driver's licenses.) Hawaii Car Rental. Car rentals should be booked as soon as possible as the price charged is based on a supply/demand basis. The exception is Waikiki where you will not need a car on a permanent basis so just rent a car the day before you want one. Collision insurance coverage is very expensive through car rental companies (it can easily double your daily rate or more). Consider using a credit card with collision coverage. All U.S.-issued consumer Visa credit (but not debit) cards, many MasterCard cards and some American Express cards include secondary collision coverage; some American Express, Visa business and Diners Club cards offer primary coverage. Alternatively or additionally, prior to your trip, verify that both collision and liability (also called third-party) coverage from your own auto insurance company extends to rental cars. Car rental rates for 5- or 6-day periods are often the same as 7-day rentals. Use a credit card that includes medical and trip cancellation insurance benefits; if you cannot, consider buying trip insurance from your flight travel agent. Also be aware some hotels may charge you for car parking; check with your hotel for parking fee before you book your car. International tourists with non U.S. credit cards are not covered by the above. By clicking on your country of origin when obtaining a quote from the car rental company's website, often an inclusive quote with loss damage waiver and supplemental liability insurance is provided. Otherwise using a travel agent website within your country e.g. your local Expedia website or local car hire broker will often also include insurance in their quote. Be aware that outside of the major highways (H1, H2 and H3) most locals refer to the roads not by number but by name, and will likely not understand if you ask for a road by number. For example you would never hear someone refer to Kalanianiole highway as "route 72" or "highway 72." Scooters are also an excellent alternative to getting around the islands. Rental rates are fairly cheap (about $50/day, or $135 for three days). The scooters are also fun to ride and are cheap on gas (typical mileage is 100-130mpg). For scooters that can go over 35mph or have an over 49cc engine, you'll need a motorcycle license. Mopeds don't require a license, but the driver must be over 15, and it's illegal for two or more persons to ride a moped, although this may not be enforced in more remote areas such as Big Island. On most islands, you can also rent out Harley-Davidson motorcycles. Hawaiian and English are the official languages of Hawaii. However English is by far the main spoken language. There are some subtle differences in usage (see below), but standard English is universally understood in Hawaii. Hawaiian "pidgin" English, spoken by many locals, incorporates bits of Hawaiian, Chinese, Japanese, Filipino, Portuguese and many other languages, in addition to its own unique idioms. As Japan is the most important international tourist market in Hawaii, many tourist destinations offer information in Japanese and have personnel who can speak Japanese. There are also many ethnic communities that speak languages such as Mandarin, Cantonese, Tagalog, Ilocano, Vietnamese, Korean, Samoan and the native Hawaiian language. The Hawaiian alphabet consists of 13 characters: all 5 vowels plus 8 consonants (h, k, l, m, n, p, w, and the apostrophe) which are generally pronounced in Hawaiian as they are in English, except that w can also take on the sound of v in certain words. The apostrophe is actually not an apostrophe but an ʻokina, and represents a glottal stop: the following vowel is pronounced with a catch in the throat, much like the sounds in "uh-oh" are separated. A line above a vowel means that the vowel is extended and stressed. Before the Hawaiian language was standardized, the alphabet consisted of sounds from all 26 English phonetic syllables. Some words included "s", and "b", such as "Boki" for "boss", and "Iesu", for "Jesus", when Christianity was introduced to the Hawaiian islands. Always refer to the continental United States as "the Mainland" rather than "the States." For instance, say "Back on the Mainland..." instead of "Back in the States..." Hawaii has been one of "the States" since 1959, and the Hawaiian sovereignty movement notwithstanding (see Respect below), most Hawaii residents are proud to be part of the United States. Using the term "the States" (implying that Hawaii is somehow foreign) may be seen as naive at best and condescending at worst. However, don't be surprised if some local people are condescending towards you because you are from the mainland. The "local" vs. "mainland" difference is something local people are only too happy to point out. Also, "mainland" includes places like Manhattan, Key West, Long Island, and Bar Harbor, even though those locations are all on islands themselves. Residents of Hawaii do not necessarily consider themselves "Hawaiian." For instance, when asking a Hawaii resident, "Are you a native Hawaiian?" don't be surprised if his reply is "No, I'm Japanese." On the Mainland, for example, a Californian means any person who lives in (or has ties to) California. However, in Hawaii, the terms "Hawaiian" or "native Hawaiian" are reserved to mean someone who is descended from the aboriginal people of Hawaii. This definition even appears in state laws. Because Hawaii is made of people of various ethnicities, someone whose family may have lived in Hawaii for generations may still not be Hawaiian by the above definition. To avoid misunderstanding, it is best to refer to Hawaii residents as such, or as Islanders, "locals", or kamaʻaina (as above), unless you know for a fact that they are of native Hawaiian descent. As in the rest of the United States, U.S. dollars are the local currency. There are plenty of banks, ATMs, and money change offices in all cities. ATMs are scarcer on the North Shore of Oahu and other rural areas. For a number of reasons, prices for most goods are more expensive than on the mainland, which means foreign visitors should focus on buying made-in-Hawaii goods. First, Hawaii is an island chain in the middle of the Pacific Ocean, which means most goods (and raw materials) must be transported there over great distances at enormous expense. Second, most goods are manufactured nowadays in East Asia, but thanks to certain U.S. federal laws, foreign-flagged container ships are prohibited from stopping at Honolulu to unload goods bound for Hawaii and load goods bound for the mainland. Instead, those ships proceed directly eastbound from East Asia (passing Hawaii in the process) to the West Coast of the United States, where distributors then repack Hawaii-bound goods and send them westbound on domestic-flagged container ships. Once those goods finally reach Hawaii, their retail prices must necessarily include all those additional ocean transportation costs. Hawaii has a 4% general excise tax (GET) statewide on the gross receipts of all businesses, which is generally visibly passed on the consumer as a de facto 4.166% "sales tax." As of 2007, the City and County of Honolulu adds an additional half-percent on the excise tax rate, making the "sales tax" rate on Oahu 4.712%. Unlike a true sales tax, the GET is levied on gross receipts of all businesses, not just consumer-facing ones. This means the GET is like a value-added tax in that it targets every segment in the supply chain, but it is actually much broader than a value-added tax in that it is levied on the entire final price at every segment. A true value-added tax targets only the value added by each segment. Even worse, the GET is actually levied on itself (in the sense that it is levied on the final price, but then the final price goes up because the tax has been added, and so on in circles), leading to the strange percentages noted above. Other than the stereotypical grass skirt (which is not generally worn in Hawaii except by hula dancers), no pieces of clothing are more associated with the Islands than the aloha shirt and the muʻumuʻu ("muumuu" in English). The ever-present aloha shirt comes in a wide variety of designs. On one end, there are the brightly colored, tourist-oriented, polyester aloha shirts that many tourist-oriented stores throughout the Islands carry. On the other end of the spectrum are the type of aloha shirts that have become standard business attire among businessmen in Hawaii, in the same way that the business suit is on the mainland. These aloha shirts are usually cotton-polyester blend and are "reverse print." Reverse print means that the design is printed on the inside of the shirt, resulting in a more muted, businesslike look. This kind of aloha shirt can be found in department stores. A special note on shoes: The item commonly referred to on the Mainland as a "sandal" or "flip-flop" (or more limited "thong") are called on the islands a "slipper" or "slippa". Using a mainland term for the shoe will get you a quizzical look from locals. Call them by their island name and they will instantly know what you are talking about. The Hawaiian islands offer a vast number of activities. Hula dance lessons and Ukulele lessons are popular among tourists. Hiking and eco tours are popular on most islands, with opportunities for horseback riding, ATV, air tours, and other methods of exploring the landscape. Museums and historical sites such as Pearl Harbor are also to be found throughout the islands. Cultural activities such as the Polynesian Cultural Center on Oahu also make for interesting day-long activities. Oahu is famous for Pearl Harbor tours, but also popular are shark snorkel dives in cages, Waikiki snorkel tours as well as around Oahu Tours where you will see all the major highlites of Oahu including Diamond Head, the North Shore and Dole Plantation where you can sample menu items made from fresh picked pineapples. Kauai is untamed and beautiful. It has been featured in many major motion pictures over the past two decades. See this island by land or by air to take in the true beauty of this island. The Big island is the volcano island where you can take a land tour or fly over the incredible huge volcano on a helicopter tour. Doors off flights allow you to feel the heat from the volanco, an amazingly unique experience. Also on the Big Island you have the rare opportunity to swim with wild dolphins, not captive ones. Given the current economic boom, the unemployment rate in Hawaii is at its lowest point in many years, as of February 2018, at 2%, among the lowest nationwide. Hawaii is not an easy place to legally find casual work for non-US work permit holders. To apply for a local government job, by law you must be a Hawaii resident. This is changing though. Currently, police officer applicants do not have to be residents. Volunteering in Hawaii is very common for many visitors interested in eco-tourism. More and more people every year sign up with an organization called WWOOF Hawaii , to be a part of the organic movement in Hawaii. Through WWOOF Hawaii, members can get in touch with over 280 organic farms throughout 5 of the main Hawaiian islands and volunteer anywhere from a couple weeks up to a year. Not only do members get to learn about organic farming in Hawaii, but they also receive fresh organic food and get to live on a farm. 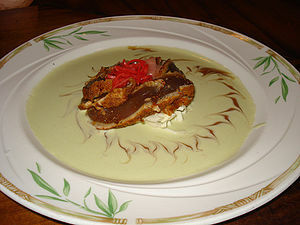 Contemporary food in Hawaii, like the language and popular culture, is a medley of traditional Hawaiian, Asian, and Portuguese. Pacific "fusion" cuisine was largely invented in Hawaii. Well-known local chefs include Sam Choy, Alan Wong, Russell Siu, Roy Yamaguchi, and George "Chef Mavro" Mavrothalassitis. Seafood is, of course, fresh and tasty. Local beef comes from ranches on Maui and coffee is grown on the Big Island. Tropical fruits such as pineapple, mango, bananas, guavas, and papaya, as well as fresh sugar cane, can be bought in most corner stores (although you may be surprised to learn that many of those fruits are now imported from distant locales such as The Philippines & Brazil). One of the most common ways that local food is served is in the form of plate lunch, usually meat or fish with two scoops of rice and macaroni salad. It's always a good deal at any lunch wagon, mall, or outside food court. L&L Drive Inn  and Zippy's  are probably the most widely distributed chain of plate lunch spots in the Hawaiian islands. Branches of L&L are in some locations on the Mainland as well (as L&L Hawaiian Barbecue). Another way of enjoying local food when roaming around the island is to keep an eye out for the converted trucks/vans that are parked in their regular spots in gas station parking lots, some parks and a variety of places on the island. They offer the "plate lunches", are popular with the locals and provide great meals (on plastic plates} at very reasonable prices. There is no reason to fear them, they are very common and popular. Perhaps the best setting for tourists to enjoy traditional Hawaiian food is at a luau (lū‘au), a traditional Hawaiian feast. Tourists can find luaus at various locations in the Islands, including many of the major resort hotels. At a modern luau traditional Hawaiian favorites are served buffet style, and there is also Hawaiian music, hula, and other Polynesian entertainment. The downside is that they can be pricey and prices can vary widely; expect to pay between USD $50 and $90 per adult and about half that per child. Ahi, yellowfin tuna, excellent as sashimi (Japanese style sliced raw fish) or as poke (chopped and seasoned raw fish). Malasada, Fried bread rolled in plenty of sugar, often sold at special events. Portugese origin. Manapua, local name for a popular type of Chinese dim-sum otherwise known as char siu bao. Cured sweet pork wrapped in soft white bread. Spam musubi, an unorthodox variant of Japanese riceballs (musubi), composed of salted rice formed into a rectangular shape and topped with spam, wrapped in seaweed. Popular enough to be sold in every Hawaiian 7-11. Chicken/pork adobo, Filipino dish widely offered and appreciated in Hawaii. Loco moco, this local specialty consists of a hamburger patty on rice, topped with over easy egg and gravy. Excellent with tabasco sauce. Can be eaten for breakfast or lunch. If you are roaming the island away from tourist areas, you may find restaurants are scarce. Many of the numerous golf courses have dining rooms open to the public that offer great meals at very good prices. They seem to welcome the non-golfer. For specific places at which to eat, see the individual island or city articles. Be sure to check the coupon books that are available at display stands for meal specials. Theft is a big problem in cities as well as beaches and parks. If you are camping on a beach, keep bags locked in a car (but don't assume that they are safe in the trunk, especially if you are driving a rental) and keep valuables in a hidden money belt. Although Hawaii is generally considered relatively safe, it does have some violent crime, especially in Honolulu. Consequently, women should not walk alone in unlit areas. Although Honolulu has one of the lowest violent crime rates of metro areas in the U.S., use your common sense. Stay smart and act as if you were in your own home city: lock doors, lock cars, and don't leave valuables lying around. In general, do not bring anything to the beach that you will not use. If you absolutely must, keep valuables to a minimum (such as money), and bring a friend. If you are using a rental car and do not have valuables in it, leaving the window open can ward off window damage from break-ins. Purchasing local bumper stickers and placing them on your car can also ward off would-be thieves, who may mistake your car for being a local's. Hawaii isn't the best place in the U.S. for gambling. Unlike most of the lower 48s, Hawaii is one of the few U.S. jurisdictions with a strict enforced law against gambling of any type. All forms of gambling are illegal in Hawaii, and it isn't recommended to get involved in any activity of the sort. In fact, promoting gambling to any degree is a class C felony in the state. Hospitals in Hawaii meet U.S. standards for care, and can be found in the urban areas of each island. The hospitals in Honolulu are larger and have the most advanced equipment; the hospitals on the neighbouring islands provide general care. There is currently a shortage of specialists on the Neighbor Islands. Depending on where you are and the seriousness of your condition, be advised that you may need to be medically evacuated to Honolulu for treatment. If you plan to go hiking in the backcountry or go swimming in freshwater pools in Hawaii, be advised of the risk of catching leptospirosis. Leptospirosis generally causes flu-like symptoms; in rare cases it can be fatal; the incubation period can be from 2-30 days after exposure. Do not swim in freshwater pools if you have open sores; see a doctor if you develop flu-like symptoms after hiking or swimming. Be sure to have travel health insurance. If you are a U.S. resident with private health insurance, you should consult your insurance carrier to determine what copayments apply and to what extent your insurance is accepted in Hawaii by doctors and hospitals in the event you need health care while on your trip. See Stay healthy in United States of America for more information. When going to the beach/swimming or spending extended periods in the sun, always wear suntan lotion or sun guard to protect your skin from burns. Do not underestimate the Hawaiian sun, the UV ray index gets extremely high throughout the year. UV rays also pass right through clouds, so you can get still get sunburned on cloudy or overcast days. Be aware that box jellyfish arrive near off shore on beaches throughout the state about 7 to 10 days after the full moon every month. Box jellyfish stings are incredibly venomous and painful, but rarely kill humans. Always listen to lifeguards as they will know about jellyfish conditions and are trained to render first aid for stings. You can also check for box jellyfish warnings ahead of time on Hawaii government websites and local news stations. Hawaii's laid-back reputation extends to dress: with ideal weather year-round in most places, shorts are always appropriate around the islands. Long pants are fine, too, and you will still be quite comfortable. You do normally need to wear a shirt in public; going bare-chested is for the beach, although businesses near the beach are tolerant of it, particularly outside of the city. Sandals and flip-flops are very common, but note that they're always called slippers or slippa by locals. Going barefoot off the beach is uncommon, but again, businesses may tolerate it to some extent. The business aloha shirt extends also to dressing up for fine dining, entertainment, and even church; some preachers wear business aloha shirts for church services. As a visitor, just put on a collared shirt, shoes, and, depending on the restaurant you're going to, either shorts or slacks. Ties and jackets will never be necessary. As is the custom in many Asian countries, always remove your footwear when entering the home of an island resident, if so invited. Hawaiian culture should be respected and travellers should be sensitive to the state's rich cultural heritage and diversity - and the fact that the tourist experience of Hawaiian culture may only scratch the surface. For instance, there are many heiau (temples) in the Islands, where the ancient Hawaiian religion was practiced. Some of these have become tourist attractions in their own right, but visitors should nevertheless treat these places with the same level of respect one would show at a place of worship. If you visit Hawaii Volcanoes National Park, you will no doubt hear about Pele, the Hawaiian goddess of volcanoes. An urban legend has it that people who have taken volcanic rock from the slopes of Mauna Loa or Kilauea have suffered various misfortunes; it is believed that it is the wrath of Pele. In any case, it is illegal to take rocks or other material from a national park. Also, the status of Native Hawaiians vis-a-vis the U.S. federal government has become a hot topic in recent years, with some Native Hawaiian groups seeking a degree of sovereignty for the Hawaiian people as redress for the overthrow of the Hawaiian monarchy and U.S. annexation in the 1890s. (Honolulu is home to the only royal palace on U.S. soil.) There is currently no consensus among Native Hawaiians on what form this sovereignty should take, with some preferring the status quo of ordinary citizenship, some seeking a status similar to that of Native Americans, and some wanting complete independence and secession from the Union. In addition, private and government programs that benefit Native Hawaiians have been called into question via a series of lawsuits that have received extensive coverage in local media. Discussions of Hawaiian sovereignty and programs can arouse a variety of strong opinions (both in support and in opposition) among Hawaii residents of all ethnicities, and the uninitiated visitor would be wise to avoid bringing up these topics in casual conversation. Hawaii uses the U.S. postal system  with zip/post codes ranging from 96701 to 96899. Internet access can be found in most tourist areas and many hotels. General wi-fi access is available only at select hotels and cafes. The public libraries offer Internet access, but only for library cardholders. Visitors may purchase a 3-month library card for $10.00. Hawaii's area code is 808. When dialing any off-island telephone number (to the mainland, Canada, Bermuda and the Caribbean), dial 1 + area code + phone number, otherwise dial 011 + country code + city/area code + phone number. You must include the 808 area code when calling another island. Located in the middle of the Pacific Ocean Hawaii has few nearby neighbors. This page was last edited on 5 March 2019, at 23:23.